If one is looking to highlight the best representation of “Far Out” in jazz music, one may very well settle with placing the spotlight on musician and philosopher Sun Ra, more formally known as Le Sony’r Ra. Born in Birmingham, Alabama in May 1914 with the more mundane name of “Herman Poole Blount”, and early on nicknamed “Sonny”, Sun Ra was a precocious and highly intelligent child soon writing his own compositions at the age of twelve as well as exhibiting good sight reading skills and piano technique. Living in Birmingham, he was able to hear many famous bands and jazz artists including Fletcher Henderson, Duke Ellington, and Fats Waller. It is said that Sun Ra, much like other gifted musicians like Wolfgang Mozart, had the ability to hear a single performance (in this case a big band performance) and then later accurately transcribe the music that had played. He attended college for a year on a scholarship as a music education major, but dropped out: according to Sun Ra this being due to an extra-terrestrial experience as initiated by aliens. In Sun Ra’s own words: “They wanted me to go to outer space with them. They were looking for somebody who had that type of mind. They said it was quite dangerous because you had to have the perfect discipline. I’d have to go up with no part of my body touching outside of the beam….It looked like a giant spotlight shining down on me, and I call it ‘transmolecularization’ — my whole body was changed into something else…. I call that an energy transformation because I wasn’t in human form. I thought I was there, but I could see through myself. After leaving college, Sun Ra formed his own band, “The Sonny Blount Orchestra”, with intense rehearsals only surpassed by Sun Ra’s own committment to music. When drafted in 1942, Sun Ra declared himself a conscientious objector, ultimately ending up performing alternative civilian service, assigned to forestry work during the day and played the piano at night. In 1945 he moved to Chicago, part of the wave of migration of American slave descendants from the south to the north and got a job arranging for Fletcher Henderson in 1946. He also had work accompanying Billie Holiday and played in a trio with saxophonist Coleman Hawkins and violinist Stuff Smith. In 1952, Sun Ra forms a “space trio” and changes his name to “Le Sony’r Ra” — the trio later becoming an orchestra, the Sun Ra Arkestra, as he starts to simply refers to himself as Sun Ra. In 1957, he and his friend and business manager, Alton Abraham, establish the “Le Saturn Records” label, perhaps the first African-American record label. From 1957-1966, album after album is released, with well over one hundred albums recorded during Sun Ra’s career. Sun Ra’s catalog displays a wide range of musical styles. Some notable titles include the 1957 release, “Super-Sonic Jazz” with some particularly unusual albums in the mid-sixties, including not only his free-jazz or more exotic material, but even more accessible albums like “Impressions Of a Patch Of Blue” with Walt Dickerson, and the Sun Ra Blues Project’s “Batman and Robin”, both from 1966. Less accessible, and one of his furthest-out albums, is his LP, “Strange Strings”, recorded in 1966 and released in 1967. The first track “Worlds Approaching”, is brilliant — one of those original works that defy categorization: structured, somewhat tonal, dramatic, and ablaze with intensity and energy. This is music that might have really come from Outer Space! The second track of the first side “Strings Strage, and the entire second side, “Strange Strings”, share common ground with some of the “concert hall” aleatoric music (music that incorporates elements of chance) of the 1950’s and 1960’s. Basically, after assembling the widest and wildest variety of string instruments including Ukuleles, Mandolins, Kotos, Koras, Pipas and any other string instruments that could be located, supplemented by a sheet of metal, and miked “sun columns” (golden metal tubes with rubber bottoms), Sun Ra assembled his orchestra, the Sun Ra Arkestra, distributed the instruments, and told his musicians: “You’re playing from ignorance–it’s an exercise in ignorance. We’re going to play what you don’t know and what you don’t know is huge”, both acknowledging their lack of training and experience in playing these instruments and instructing them to perform music representing their general metaphysical ignorance. It’s clearly music that would be more interesting to experience live than on an LP or CD. It’s noteworthy that these are talented musicians, experienced in free jazz expression, and guided during the performance by some direction from their leader. It’s also particularly interesting that no effort was made to tune these instruments and so the result is extreme microtonal free jazz. From a historical perspective, it’s important to acknowledge Sun Ra’s role in Afrofuturism and in asserting his own and others’ civil rights. Groundbreaking individuals like Sun Ra and George Russell extended the role of the African-American jazz musician from on-demand performers to innovators, thought leaders and philosophy- artists. 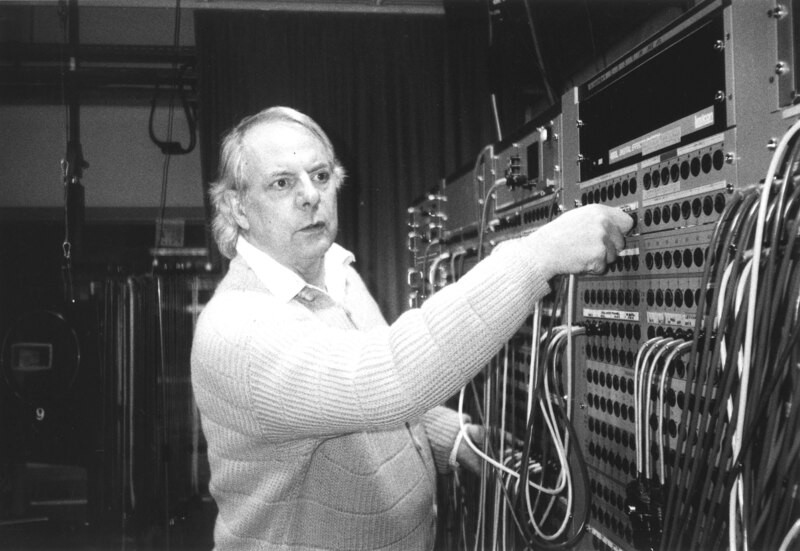 One of the leading modern composers during the 1960s and 1970s, Karlheinz Stockhausen is one of the fifty-plus people displayed on the Beatles Sgt. Pepper’s cover, and the only musician or composer on the landmark cover besides the Beatles and Bob Dylan. One of his most notable works, is “Hymnen”, a nod to various national anthems (it is divided into four “Regions” each corresponding to a national anthem) and was first performed on November 30, 1967. It must be a challenging work to listen to live; it is long and comes across as somewhat random: it is particularly challenging to listen to a recorded version. The work consists of a recorded backdrop (tape) which the musicians interact with by improvising and following scored cues provided by the composer. It is claimed to be a masterpiece by some, but like many of the products of this period created by Stockhausen and his fellow composers, it relies heavily on what the listener brings to the experience. In a concert hall, with one being part of a seated (captive) audience, one is much more likely to engage with the music than if one puts on an LP or CD of this work. For me, it’s hard to listen to more than twenty or thirty minutes without feeling compelled to switch to something else, particularly when having a fairly large music library of more accessible music. Hymnen Elektronische Musik mit Orchester. 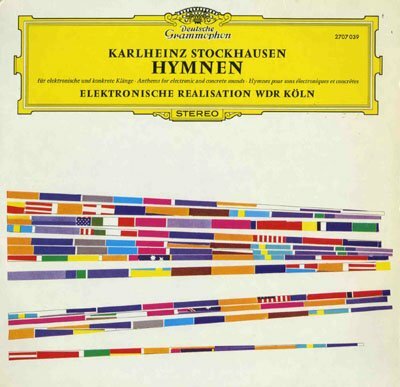 Gürzenich-Orchester der Stadt Köln, conducted by Karlheinz Stockhausen. Stockhausen Complete Edition: Compact Disc 47. There’s no shortage of far-out pop/rock albums in 1967. In May 1967, Elektra records releases this narrative concept album (poems read over and integrated into a musical background) of twelve tracks — one for each of the signs of the Zodiac. Like the the Sun Ra album and Stockhausen’s “Hymnen”, this work benefits from being played in a dark room or with one’s eye’s closed, however, in this case, the producers of this work made sure to include the instructions “Must be Played in the Dark” on the back of the album — and one is well advised to follow such instructions. From its air-raid like opening to its tranquil conclusion, this album is exploration of 1967 psychedelia, far out, but within convenient reach of most listeners. Notable is the presence of the moog synthesizer, electronic keyboards, sitar, and jazz musician Bud Shank on bass flute, all in support sixties-styled melodiously cool lyrics read in the most mellow delivery possible. The tracks vary in tone and style and are generally quite interesting including the more progressive sections of music found in tracks like “Scorpio” with its heavy percussion, dark suspenseful bass line and mixed meter passages and the adventurous “Sagittarius” (also laden with interesting percussion work and a playful mixed meter riff.) One can make the case for this as being both the first rock concept album (it precedes Nirvana “The Story of Simon Simopath by a couple of months) and the first progressive rock album (coming out several months before “Days of Future Passed” and apparently a few days before “Sgt. Peppers.”) To what degree this adventurous “Zodiac Cosmic Sounds” influences later concept albums, such as The Moody Blues’ “Days of Future Passed” which covers times of the day as opposed to Zodiac signs, is something I invite speculation on. Feel free to muse about this on your own time or in the comments section of this post. Anyone who prides themselves on understanding the history of progressive rock should consider this album to be required listening. Lyrics are available here. Album currently not in print, but available used from multiple sources and youtube.